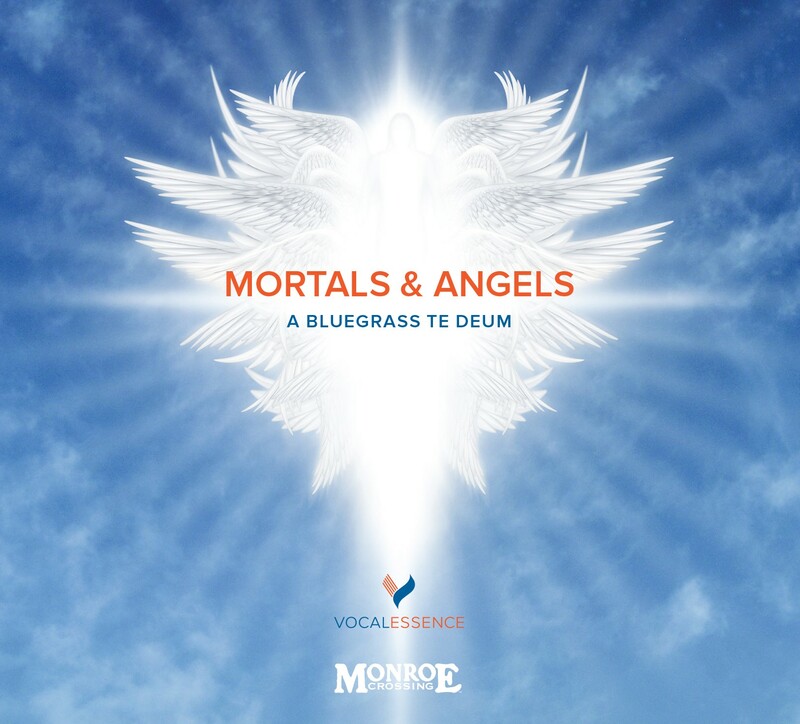 It’s time for another mashup of Minnesota musical genres, as Minnesotan choral legends VocalEssence and bluegrass quintet Monroe Crossing team up for a new recording, Mortals & Angels: A Bluegrass Te Deum. Mortals & Angels: A Bluegrass Te Deum is an original work by Minnesota composer Carol Barnett and librettist Marisha Chamberlain, and is an unexpected and engaging exploration of what happens to traditional religious choral forms when pushed in the direction of spirited folk storytelling. This new piece is a follow-up to a previous collaboration, The World Beloved: A Bluegrass Mass from Barnett, Chamberlain, Monroe Crossing, and VocalEssence. The new CD includes songs by Monroe Crossing and two choral arrangements by Carol Barnett of original numbers by Monroe Crossing’s Lisa Fuglie — music that premiered at the November 10, 2017 VocalEssence and Monroe Crossing concert, Bach & Bluegrass Jamboree. VocalEssence, called “one of the irreplaceable music ensembles of our time” by Dana Gioia, past chairman of the National Endowment for the Arts—and the choral ensemble that Mick Jagger of the Rolling Stones says “sings magnificently”—inspires thousands of students, singers, and composers each year through its programs, contests, and support for innovative art. VocalEssence was founded in 1969 and has debuted more than 250 commissions and world premieres. For more information, visit vocalessence.org. The Minnetonka High School Treble Choir is one of five choirs and twelve performing ensembles at Minnetonka High School in Minnetonka, Minnesota. Led by Director of Choral Activities Paula Holmberg, the MHS Treble Choir is an auditioned choir, comprised of 10th, 11th, and 12th grade women. Consistently earning superior ratings at state contests, the Treble Choir was selected in 2012 as one of twelve women’s choirs for the American Choral Directors Association of Minnesota SSA Consortium Project. This recording is made possible in part by Kay & Mike McCarthy, Jim and Donna Peter, and the Albrecht Family Foundation. VocalEssence recordings are made possible in part by the VocalEssence Artistic Advancement Fund with support from Louise Heffelfinger and the MAHADH Fund of HRK Foundation, celebrating the spirit of Betty Hulings.